I’ve become somewhat obsessed lately with the relationship between HR and CSR. I’ve posted on this topic using a metaphor of a budding romance between training and CSR, and I’ve written about some business examples of the value of good training and communications for CSR. This article takes a more visual approach to the topic. Inspired by a simple Venn diagram from Elaine Cohen’s excellent book CSR for HR, I’d like to propose a new leveraged approach to business communications. I’ll begin with a shout-out to Elaine for her groundbreaking work linking the HR and CSR functions. Where all too often these two areas of business are siloed from each other, HR is now picking up on the value of CSR activities to enhance core HR areas such as employee recruiting, retention, engagement, training, health and safety, diversity, volunteering, and of course employee communications more generally. 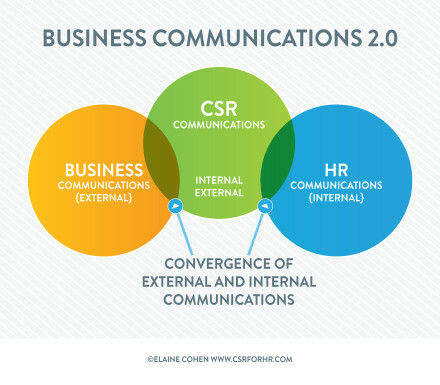 With her Business Communications 2.0 framework, Cohen shows how linking HR and CSR communications can help companies better engage their employees through communicating CSR activities internally. We love this idea, and recognize that it is a new one for a lot of businesses. Yet even in businesses where the idea has traction, it seems that implementation is where the rubber meets the road. So from my role as a CEO of a company that is as much interested in implementation as it is in strategy, I want to pose taking this idea one step further. 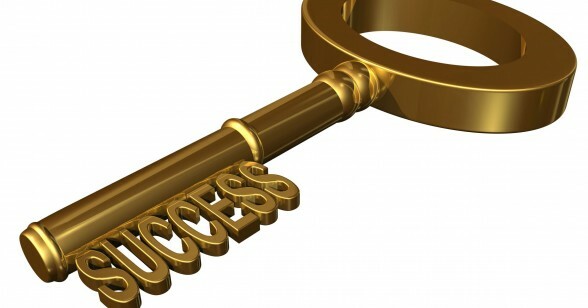 Our approach focuses on tactical efficiencies in aligning CSR, HR, and PR/marketing. It builds on Elaine’s more strategic approach, but brings all three perspectives together so that there is a sweet spot in the middle, born of alignment around shared communication needs. 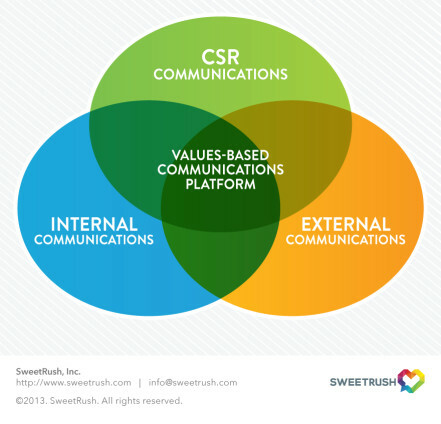 From this sweet spot, a platform for the communication of the company’s values can be created, not just at a high-level messaging perspective but as a suite of content and communications assets. Through a process of content analysis, values assessment, and needs assessment, a team can design and develop a central online expression of the company’s values and a strategy for leveraging that expression beyond this one core asset. Thus, a values-based communications platform is built. The idea here is we convene your best team from marketing, HR and/or employee education, CSR, sustainability, and PR/marketing to co-create the best leveraged asset strategy for your business communications needs. By combining your budgetary powers, you can make a truly best-in-class set of values-based communications assets. We believe this is an all-too-often missed opportunity for real learning and emotional engagement that can replace the sterile and unremarkable standards we see today. You know what I’m talking about—those plain text corporate responsibility policy documents and those thrilling CSR report PDFs, spiced up only by pie charts and pictures of people planting trees. Within the framework of the interactive CSR report, there are messaging and graphic elements that can be repurposed for other needs such as recruiting, new-hire and ongoing employee trainings, dealer and vendor communications, or for parts of the websites the company maintains for various audiences. And more. You tell us what kinds of assets would serve for your business! I’m happy to report that branding thought leaders are beginning to recognize the value of this kind of thinking. A recent Sustainable Brands post on the topic of the need for marketing chops to improve CSR reports definitely gave me some hope. Taking this and Cohen’s ideas combined, we can kill all sorts of birds (in the most humane way…) with the stone of this kind of values-based business communications platform. Perhaps business unit politics makes this win-win-win idea too good to be true, but I’ll take a stand for idealism here and simply state that the more we can bring the messaging and messengers for an organization together to collaborate on the best and most meaningful practices a company is engaged in, the better. If for some reason the ideal situation does not emerge, we do believe that even within one area of the business—say, marketing—there is a real case for this values-based platform for people to draw from within the department. Any way you slice it, from the statistics we have been seeing, the likelihood is that people inside and outside your organization right now would be more engaged by a better communication of your organization’s values and how you practice them.